These days, the Sheridan twins are 30 years old, with lives far removed from the chaos and fear of that morning. William Sheridan Jr., who lives in Weymouth, is a tax lawyer and father of two sons, Andrew, 2½, and Luke, 18 months. Nichole (Sheridan) Shurbaji, who lives in Braintree, works in her husband's dental office, and is the mother of two daughters, Alea, 2½, and Amira, who was born a week and a half ago. Their parents moved 20 years ago to a quiet street in Weymouth and run a drain-cleaning service in the South Shore town. The twins say they have no recollections of plummeting to safety. But they are reminded just about any time they see friends of their parents, older relatives, or neighbors who knew them in South Boston. Through their stories, the morning has become a vital but quiet part of their lives and histories. "Whenever they see me, they remember it right away: 'Oh my god! The little twins from the fire!' " Shurbaji said yesterday. William Sheridan Jr. said he has not shown the photo of him falling through the air to anyone other than his wife's parents, "who are fascinated." "For my parents, it's an important story, but for us, I can't even remember," he said. When she was in junior high school, Shurbaji brought the photos of her and her brother to show and tell. Her classmates were amazed and exclaimed, "Oh, my God! I can't believe it's you!" she said. At the time, Kathy Sheridan said, the twins thought it was "pretty cool stuff to show off and say, 'Hey, look at us.' "
Now that she is older, Shurbaji said, she thinks more seriously about the morning. "I'll tell you one thing," she said. "I wouldn't want to throw my baby out the window and rely on someone else to catch them. I couldn't imagine myself, now that I have young kids, doing it. But I guess I would if I was in that situation and had no other choice." 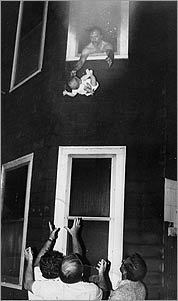 Mugar, talking about the night of the fire, said that for all his preparation as a photographer, "you act on instinct." "It's dramatic to me that baby is so helpless at that stage of its life," he said. "Not only because of the fire, but its arms and fingers are out and it's in free fall. And the neighbors did a wonderful, wonderful job of being able to catch both children." The fire started when someone left a lit cigarette on a mattress in the first-floor apartment below the Sheridans. They had no smoke detector and awoke at 3 a.m. when an alarm on the third-floor apartment sounded. "I just remember my husband saying: 'Get up! Get up! Get up!" said Kathy Sheridan, who was 24 at the time. "And as soon as I opened my eyes, the whole apartment was full of smoke." Her husband, who was 25, grabbed the twins, but thick, black smoke blocked the stairway to the street. He broke open a window, and the couple saw neighbors on the street below, screaming, "Throw the babies!" "I just couldn't do it," Kathy Sheridan said. "All I could see was concrete." Her husband took the infants, leaned out, and dropped them. "It was just one of those crazy things," he said yesterday. "And for the most part I don't think about it." The neighbors, Connally and Madden, could not be located for this article; the Sheridans have not spoken to them in years. After the fire, the Sheridans received letters from as far away as Australia and California, including a few with checks enclosed and one offering a free sublet. Someone in Sacramento sent them a painting of Nichole, a halo around her head, being dropped from the window, into God's hands. As a child, Shurbaji said, she studied the painting with awe. The first Christmas after the fire, the Sheridans gave everyone they knew a smoke detector. The parents still jump every time they smell smoke. "Even today, whenever my husband and I smell a whiff of anything, we're on the hunt," Kathy Sheridan said. David G. Mugar gave the $5,000 he received for his photo to the Sheridans, to help them replace belongings they lost in the blaze.